Thai Massage and Thai Medicine are said to have been founded by the legendary Shivago Komarpaj, a physician from over 2500 years ago. For those who are interested in Asian history and tradition, Nipha is happy to teach you the original Mantra in Sanskrit Language which is recited in Thai tradition before every medical treatment. In this Mantra we ask the father of medicine for his help and support. It’s not a short one and surely father Shivago will protect us as well if we just give him a short respectful “thank you” in our own language. He was from Northern India and is said to be a friend and personal physician of the Buddha. 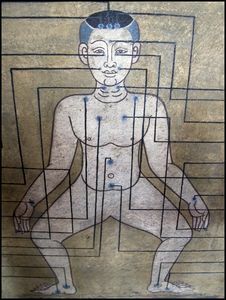 This ancient massage technique follows ten different energy lines treating different organs along these energy meridians. Thai massage helps to balance your qi (energy), which in turn promotes healing. It is one of the four branches of Traditional Thai medicine, which is a healing technique that was practiced before doctors began to work. The massage involves deep massage and stretching. There are many different styles of today’s Thai Massage. Nipha studied at the Wat Poh School in Bangkok. Today she is teaching the “ Wat Po Style” with her own experience of 30 years of working. We offer 15 or 30 hours of intensive training and provide you with learning material which will help you to remember the meridian lines and the massage techniques.